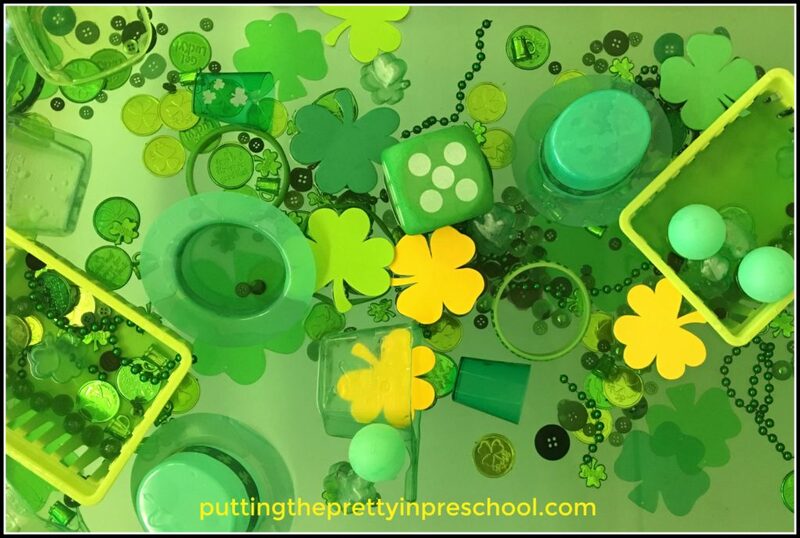 This St. Patrick’s Day water play Sensory Table is inspired by the city of Chicago’s tradition of turning the river water green as part of their St. Patrick’s Day celebrations. The tradition of coloring the water green in Chicago became an annual event in 1962, but the origins of this practice started much earlier. A green substance was used to test the river water for pollution in the early 1900s and continued in the following years. People liked seeing the color, and in 1962 the practice was implemented for St. Patrick’s Day. In 1966 the powder used became a more environmentally friendly vegetable dye. The water is turned bright green by the Chicago Journeyman Plumbers Union 130. The recipe is secret: an orange powder is spread on the water, and mysteriously turns green when mixed in. The river water becomes fluorescent green for a stretch in the center of the city. This year plumbers using three boats will complete the procedure. The first two boats will spread the powder on the water. The third boat will mix the powder in. The river water in Chicago is turned green to coincide with a large St. Patrick’s Day parade that is held on the Saturday closest to St. Patrick’s Day. This year St. Patrick’s Day falls on a Saturday, perfect timing for this activity. Irish dancers and kilted musicians playing bagpipes are feature performers in the parade. Many spectators gather around the shore or on one of the downtown bridges to watch the parade and view the brilliant green water. Iconic buildings, monuments and streets are lit in green. Cruises are offered near the green river water. Events are held featuring Irish music, dance and storytelling. Chicago celebrates St. Patrick’s Day as an opportunity for people to get together to have a good time, and to recognize what the Irish have done for their city. This St. Patrick’s Day themed water table has plenty of green items, and a few gold ones. Figures in boats can be added, as showing in the feature picture at the beginning of the post. Some of the above items can be exchanged for sailors and boats as seen in the feature photo. 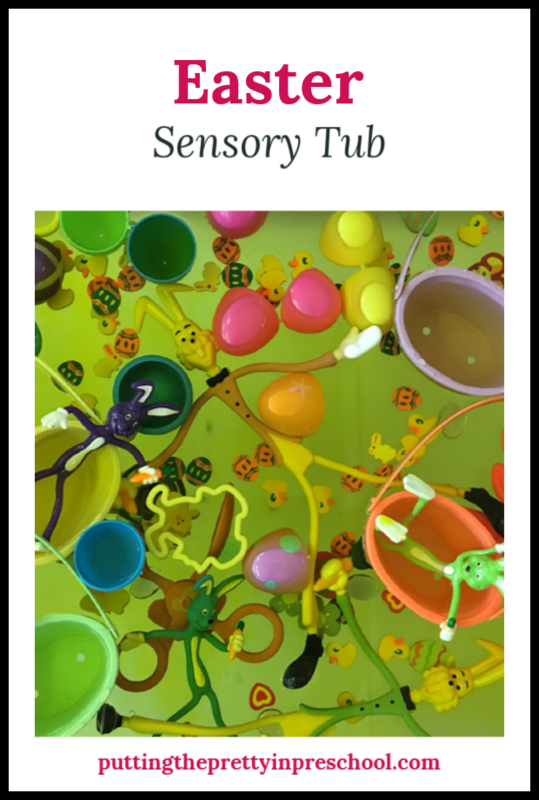 With so many craft supplies and basket fillers available to purchase, a colorful Easter themed sensory tub is easy to put together. Easter bunnies have taken over this sensory table. I hope they get back to work soon to finish delivering their Easter eggs! Neon green coloring is used in this activity. I’ve used pink, purple or yellow food coloring in the past. On July 1, Canada celebrates its 151th birthday. There will be a variety of events happening around the city of Edmonton. Pancake breakfast at the Alberta Legislature Grounds, live performances, community carnivals, free admission at the Art Gallery Of Alberta and evening fireworks are some of the activities people can take part in. Here’s a Canada Day rice sensory bin featuring the theme of our Canadian flag.